Cracked heels are also referred to as heel fissures, can range from a cosmetic issue to a painful problem, depending on its severity. Heel fissures or cracked heels occur when the skin on outer edge or bottom of heel become hard, flaky and dry. Remedies found in your home. 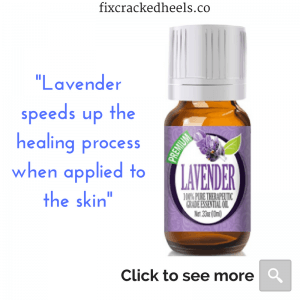 I think you will agree with me that sometimes the best ways to fix cracked heels are with ingredients and oils that you can find in your home. 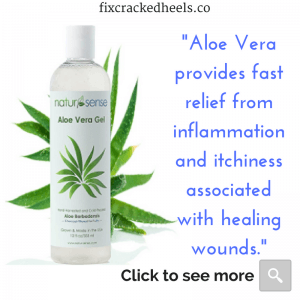 If you have mild heel fissures or small cracks on your heels, try using one of the items on our list of Home remedies for cracked heels. Most of the ingredients you can find in your home kitchen, local grocery store or naturopathic doctors office. If you are unsure of some of the ingredients or oils, make sure you try a patch test. You should also seek the advice of a medical professional. All oils should be added to a carrier oil. You can click on any of the links for convenient shopping. Castor oil-Applying castor oil to your skin will prevent inflammation, and add moisture. For best results, give your feet a good scrub with coffee grounds or sugar, rinse off and apply castor oil. Sea salt– Perfect for exfoliating, sea salt can also promote blood circulation. You can simply make a paste of sea salt and some water or oil and gently exfoliate the skin. Lavender oil-Lavender essential oil is especially effective in treating dry skin because it inhibits the growth of bacteria while speeding up the healing process of the cracks. Eucalyptus Oil– This germicidal quality makes it an antiseptic, which means it is suitable to treat wounds, burns, cuts, ulcers, sores, and abrasions. Dab one drop of oil along with carrier oil on the heels. Aloe Vera–Aloe Vera is cooling & soothing. It provides fast relief from inflammation and itchiness associated with healing wounds. It has the capacity to heal and protect the skin from any infection. Coconut oil– This magical oil can moisturize the skin. It is naturally antibacterial and has antifungal qualities. 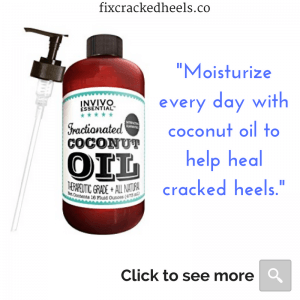 Moisturize with this every day to heal cracked heels. Apple cider vinegar– Apple cider vinegar is antibacterial and has anti-inflammatory abilities, which remove inflammation, inhibit infection and eliminate any bacteria on your skin. Apply a cotton ball soaked with apple cider vinegar to the cracks followed by coconut oil for best results. 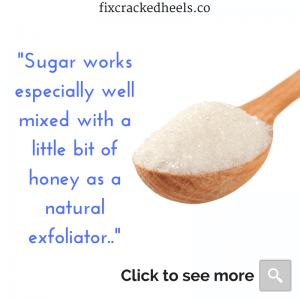 Sugar-Sugar works especially well mixed with a little bit of honey as a natural exfoliator. 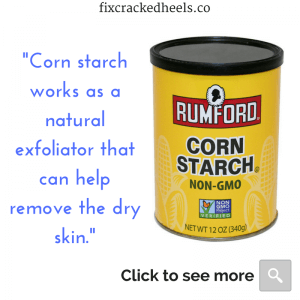 Corn starch-Corn starch works as a natural exfoliator that can help remove the dry skin. Just add water to your cornstarch and apply the paste to your skin. Lemongrass oil– It is antiseptic in nature and is great for treating wounds preventing them from getting septic. In fact, lemongrass is a common ingredient in many commercial lotions and creams used to cuts and wounds. Dab one drop of oil along with carrier oil on the cracked heels or dry skin. 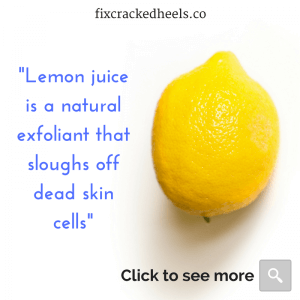 Lemon juice– Lemon juice is a natural exfoliant that sloughs off dead skin cells. Apply a coconut oil afterward for maximum results. Tea tree oil–Mix ten drops of tea tree oil with your favourite carrier oil and massage it into the skin to help heal your dry skin and cracked heels. When the skin around heel gets dried or thick callous has developed around the rim, it loses its elasticity. Thus, callous does not flex along with the inner layers of skin tissue. Impact and friction between layers of tissue while walking triggers cracking on the outer epidermis. Once cracks develop on the heel, the cracks go deeper due to ground reaction forces. This results in damage to the dermis layer. One other way to get rid of cracked heels is using a foot soak or a foot file.